Pristine beaches, without the crowds. As with many coastal communities in Australia, beaches are a main feature of Port Stephens. The beaches of Port Stephens have panoramic views and powerful surf much like most beaches in Australia, but without the crowds. Even in the height of summer, there is no struggling to find a prime place to lay in the sun. 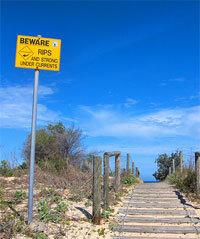 Please check all surf conditions of the beaches of Port Stephens before entering the water. Boat Harbour, great for the little kids. Birubi Beach (Stockton Beach) stretches for 32km, lots of space to fly a kite or play games. Patrolled at the Birubi Beach end, Kiddies corner near the skateboard park. Great rock climbs for the kids. One Mile Beach, a good surf beach of Port Stephens, best surfed with a SE/NE swell. Patrolled at the southern end. Good for kids most of the time. Birubi Beach, Great surf beach, best surfed with S-NE swell, Patrolled area available. Zenith Beach, best surfed with a NE swell. Not the safest beach for kids. Box Beach, best surfed with E/NE swell. Again not to good for little kids. Samurai Beach, GREAT SURF, 4 Wheel Drive access, best surfed with a S-NE swell. Can be a bit rough for kids. Port Stephens offers a whole different kind of beach experience, just 2.5 hours north of Sydney.